How could the authoress of one of history’s best known cookery books not only have stories spread that she was not the author of the work, but that she’d never existed at all? Such was the case with Hannah Glasse. 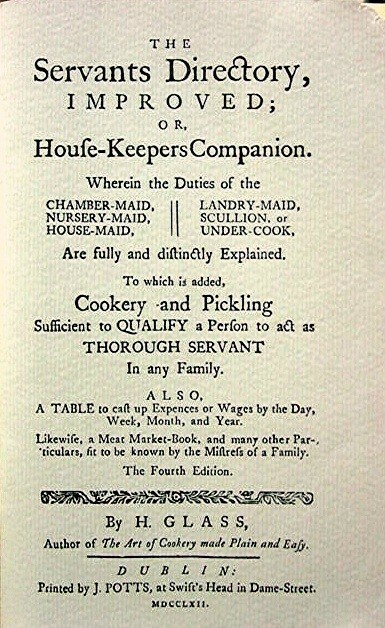 The rumors that she was not a real person and that her book, The Art of Cookery was penned by a scoundrel named John Hill seems to have been the work of publisher, Edward Dilly. Whatever would prompt someone to discredit one’s authorship to the extent of trying to erase their very existence? Greed most likely played a large role and the fact that later Mrs. Glasse, then a widow, suffered such financial setbacks that she declared bankruptcy, sold the rights to her ever-popular book to try and rectify her situation, and still ended up in debtor’s prison probably made it easy for Dilly to discredit her and be believed. I became acquainted with what Paul Harvey would call the rest of Hannah’s story by reading an article by Charles Cooper in Table Talk, April 1914. 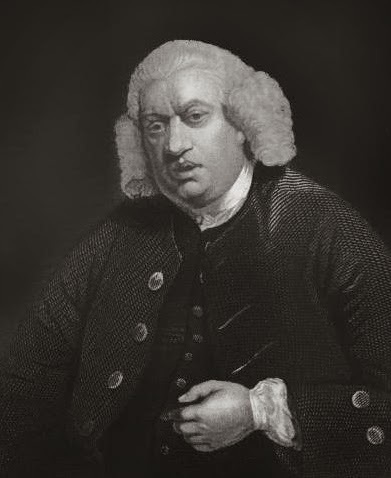 The rumor started when Dilly remarked at a party that Mrs. Glasse’s Cookery was written by Dr. John Hill and that, “Half the trade knows this.” Fortunately for Mrs. Glasse none other than the writer and dictionary author, Dr. Samuel Johnson and Boswell, his partner, were present and Johnson would have none of it. He countered the claim by saying he’d looked at the book himself and found it impossible to believe that a doctor would have written as though salt petre and sal prunella were different substances when in fact the latter was just salt petre burnt on charcoal. “Hill could not be ignorant of this”, but he allowed as how the error could have been one of transcription. By way of explanation for those non-historians reading these notes, not attaching her own name to the book and instead saying it was written by, “A Lady”, made it possible for others to claim her work, though doing so was fairly common in a time when women were expected to remain in the background and men were the movers and shakers. Perhaps Mrs. Glasse suffered the indignity of having her work and life discredited because her book was such a phenomenal success and there were those willing to go to great lengths to profit from it. It wasn’t until a subsequent edition that Glasse attached her name to the book. Again, unfortunately for Mrs. Glass, whether at her wish or the actions of others, later editions of the book reverted to listing the author by the simple appellation, A Lady, making it easy for unscrupulous people to claim it as their own work. Her full name was again given as author only after her death. Cooper described Dr. Hill as having much ability, more impudence, and no principle and outlined his many efforts in business, none of which were very successful and all of which were somewhat shady in circumstance. His character and career can be summarized by saying his life’s goal of being received into the Royal Society was never realized and he received at least one public horsewhipping from a gentleman he’d insulted. Another who championed the cause for Glasse was George Augustus Sala who carried on a lively debate acknowledging her presence in the London press just before the turn of the century. When Cooper wrote his article for Table Talk in 1914 he still did not know if Hannah Glasse was an actual person or a pen name and debated the pros and cons of the matter in the article. It wasn’t until 1938 that it was finally proven that Mrs. Glasse was indeed real and the circumstances of her life were revealed. 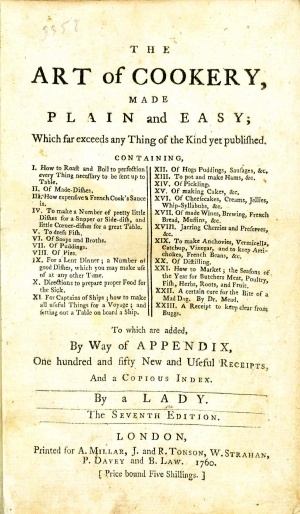 Perhaps the best evidence that Glasse was indeed real was the 68 page attack on her that was penned by Ann Cook who published a book, Professed Cookery, in 1760. Cook claimed Hannah Glasse’s half-brother Lancelot Algood, tried to ruin the reputations of she and her husband and lashed out at Algood through a poison-pen account of Glasse and her book. Glasse’s story isn’t a particularly happy one. She was the illegitimate daughter of Isaac Algood who brought her up in his household with his legitimate children and with his wife who apparently raised Hannah as her own. Hannah’s birth mother was described in very unflattering terms by Hannah in extant letters. 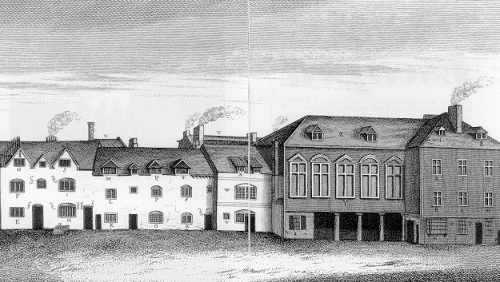 After his death, Hannah’s mother was involved in a lawsuit over Isaac Algood’s property which was not resolved until Hannah’s half-brother, Lancelot Algood (later Sir Lancelot Algood), settled the case in 1740. 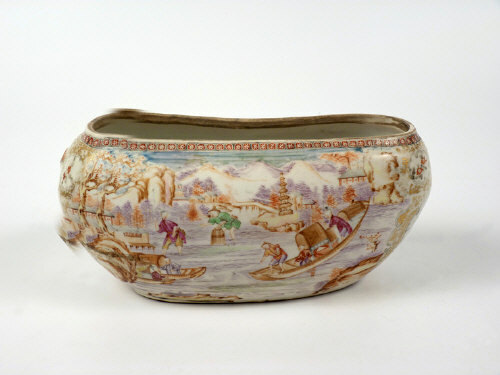 The annual allotment Hanna was to receive from her father’s estate wasn’t received by her until the settlement was reached. Hannah married at age 16 and had three sons and five daughers, some of whom died in infancy. At least three of the daughters worked with Glasse in a shop which was named in the fourth edition of The Art of Cookery. 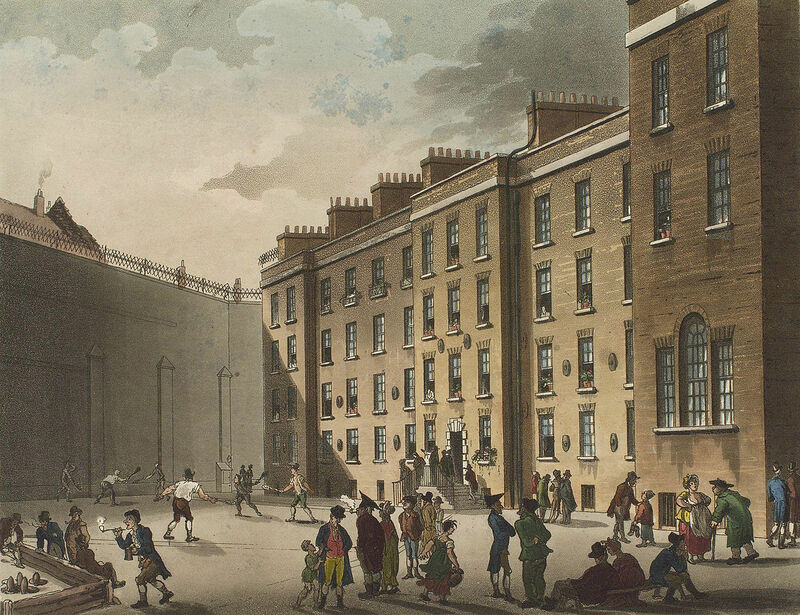 Hannah identified herself as “Habit Maker to Her Royal Highness the Princess of Wales, in Tavistock Street, Covent Garden”. 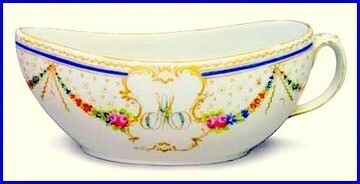 Her success was short-lived, however, and Glasse was declared bankrupt on May 27, 1754. Later that year (Oct. 29) she sold the copyright to The Art of Cookery to Andrew Miller and partners so that she could pay the debt. She was discharged from the bankruptcy on January 11, 1755 only to continue her downward spiral by being sent to debtor’s prison on June 22, 1757. She was released later that year. Glasse wrote two more books, The Servants Directory  and The Compleat Confectioner  which probably brought in enough money to keep the wolves from the door, but neither was anywhere near as successful as that first book. 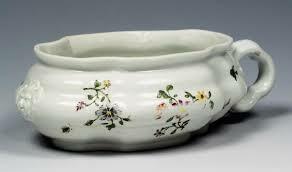 Hannah Glasse died on September 1, 1770. She was 62 years of age. A death notice was published in the London Gazette and picked up for copy in the Newcastle Currant in which she was referred to as the sister of Lancelot Allgood. Not much is known about Hannah and John Glasse’s children other than Isaac moved to Bombay and died there in 1754; George served in the Royal Navy and drowned off Pondicherry [India] in 1761 when his ship, the HMS Sunderland sank in a storm. Isaac was associated with the East India Company and, as such, signed as witness to a document on the ship Edgecote in 1756. Margaret, Hannah, and Catherine were the daughters who worked with their mother in the dress shop. Margaret, the eldest child, died sometime in the 1760’s in Jamaica. Catherine supposedly married a Mr. Hart, and nothing further was found on Hannah. Of the children, Lancelot, Isaac, George, Eliza, and Elizabeth Mary are known to have been christened in St. Andrews Church, Holborn, London (1736, 1738, 1740, 1741, and 1743 respectively]. Dictonary of National Biography. Pages 420, 421. 1890. London. Cooper, Charles. Some Old Cookbooks and their Authors, published in Table Talk. April 1914. Pennell, Elizabeth Robins. My Cookery Books. The Atlantic. Aug. 1902. Dodds, Madeline Hope. Archaeologia Aeliana. Vol. 15. “The Rival Cooks: Hannah Glasse and Ann Cook”. The Independent. Sat. June 24, 2006. 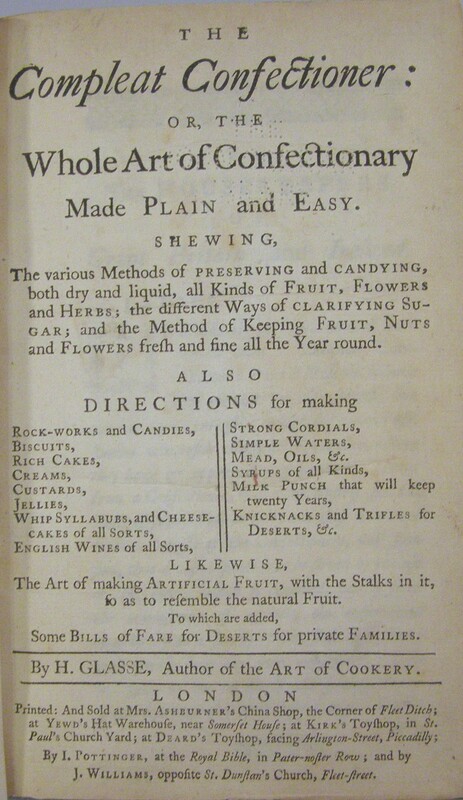 Various editions of The Art of Cookery. We constantly research items and customs and have seen some pretty strange situations where someone has bought an item or is trying to sell an item and has absolutely no idea what it is. 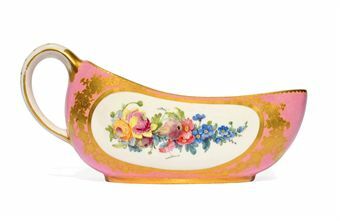 The owner of an antiques store I used to frequent told me she was selling chamber pots like gangbusters because “upwardly mobile” women caught up in the antiques movement thought they were soup tureens. When I asked if she told them what they were she said no, their money was green and when they left the store she didn’t care what they used them for. 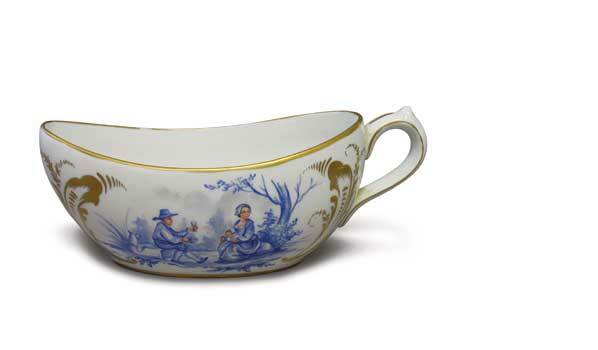 I still laugh every time I see one and the “one-handled soup tureen” is a running joke with us as we shop. Equally bizarre was an antique store proprietress who had a Victorian body basket (coffin) in her shop for sale labeled as a vegetable basket. A 6-foot-long vegetable basket with handles down each side? Even after I explained to her what it was she went on to tell us she puts it on her dining room table at Easter with flowers, Easter eggs, and pastries in it, but that’s fodder for another post. 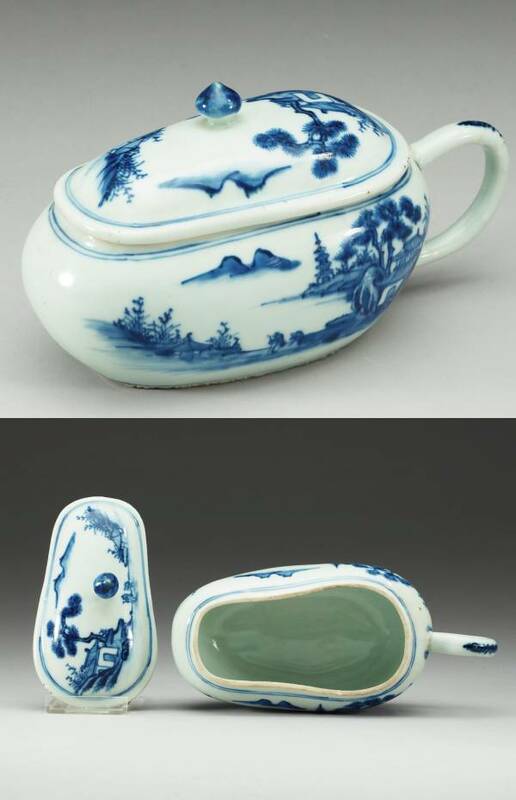 Riding the same train of thought as the chamber pot-soup tureen we recently wondered how many 18th century female urinals are locked away in china cabinets or gracing holiday tables under the guise of a gravy boat. The urinals were used in days when there were no public toilets, read here, “no rooms designated just for relieving one’s self”. Women would lift the layers of petticoats, work around panniers or other foundation support, and let go, perhaps in a dark corner or behind a screen, the thought of which makes me shudder today. 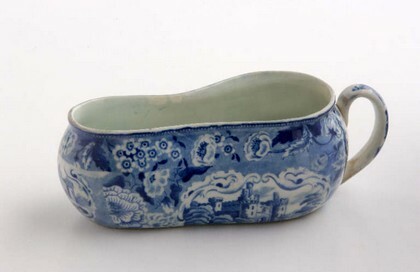 The urinals were made of faience or porcelain, silver, glass, pottery, creamware, leather, or earthenware and were priced for sale according to their quality and extravagance. They were made in English factories and also in China for export. Often they came with box or a leather case for carrying and storage. 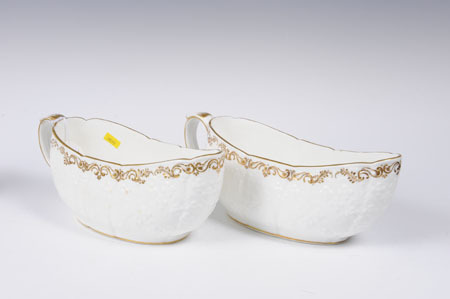 Increasing the likelihood that they may be thought gravy boats is the fact that they sometimes came in the same patterns as dinnerware. 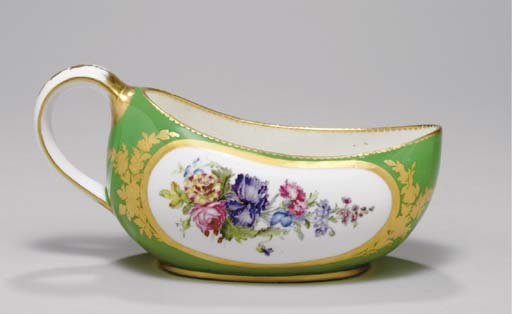 he urinals were known by other names such as coach pot, carriage pot, slipper, traveling chamber pot, and multiple spellings of bordaloo (bordalou, Bourdaloue, etc.) or in France pots de chambre. 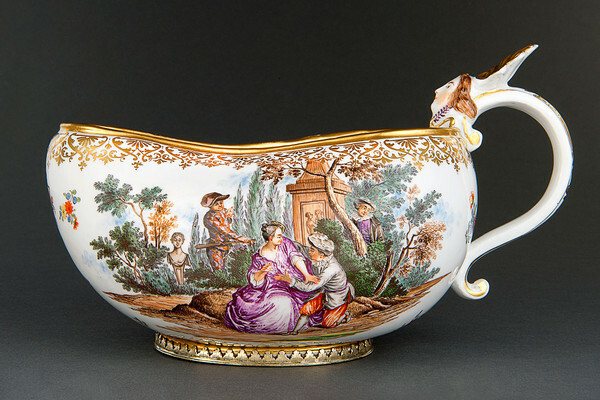 Legend has it the vessels were called a bordaloo because ladies attending the long-winded sermons of Bourdeloue often needed to relieve themselves before the end of services. 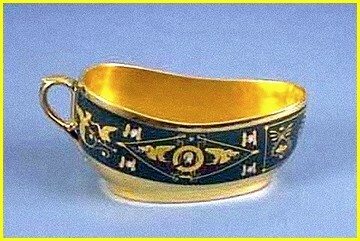 They have a ring handle on one end, the other end open, they may or may not have had a lid, and in many cases with antiques the lids may have been broken at some point in the piece’s history. The open end is usually slightly, sometimes very slightly, in-turned at the tip rather than turned outward more like a pouring spout.